Rxh2, f1Q, 2. Rh5+, Kxe4 3. Rd5 then = is possible? 3. Kc3 Kf3 4. Kd3 Kg2 5. Ke2! ( threatens 6. Rxh2+) 5…Kxh1 6. Kxf2. That’s a pretty neat puzzle. Good one. 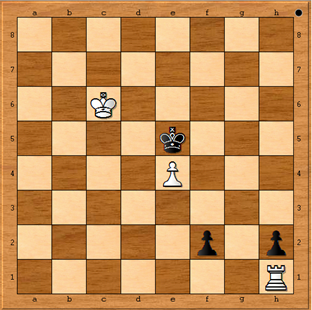 If the Bl K tries to come via e2 to promote the f pawn White just takes on h2 and the f pawn is pinned. A cunning stunt, as they say. Next Next post: Stop the Press!! Hold the Front Page!! !